You need to try this ravioli before you die. According to Wikipedia, Zocca is a municipality in the Province of Modena in Italy. It's also the last name of my friend Sophia, who I recently had the pleasure of dining with at Seven Hills Restaurant in Russian Hill. (Yes, I realize that doesn't start with Z...but I promise you don't want to wait 20 weeks to hear about this place). Sophia knows a thing or two about good Italian food. Her father lived in Trapani, Sicily until he was 17, and the family owns Trattoria Pinocchio in North Beach. So when Sophia suggested Seven Hills, I had a feeling we were in for a treat. It's a cozy space, tucked away on Hyde Street, and the food is fantastic. According to their Yelp reviews, people really enjoy the Salmon Bruchetta. 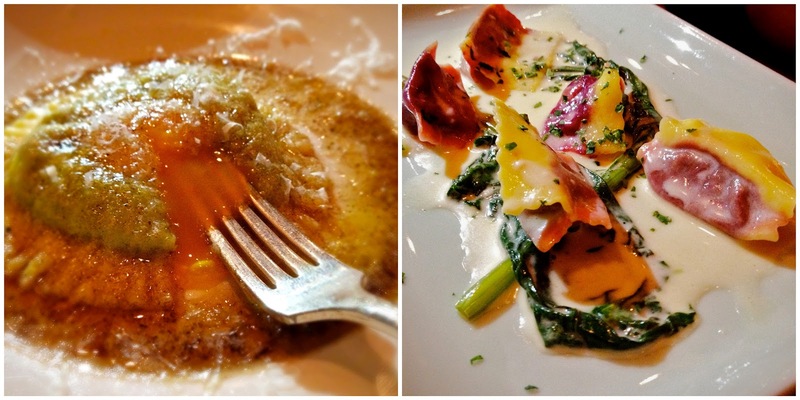 But instead, we went for the Kampachi Carpaccio and Burrata. The kampachi is similar to tuna and it was thinly sliced and served with slivered radishes and jalapeño and drizzled with meyer lemon and Sicilian extra virgin olive oil and Trapani sea salt. Oh. My. Gawd. So good. The burrata was creamy and delicious and stacked on Roma tomatoes with micro greens and green onions and dressed with Sicilian extra virgin olive oil, balsamic vinegar and Trapani sea salt. It's a giant ravioli stuffed with house made ricotta cheese, spinach, and a Full Belly Farm egg yolk that flows all over the plate when you cut into it. It comes swimming in brown butter and white truffle oil. (I could take a bath in that combo). I would like to eat this dish every day for the rest of my life. Seriously. We also got the Agnolotti with red beets and Fontina cheese sauce. Agnolotti is sort of like a folded-over ravioli. This dish was good, but definitely not my favorite of the evening. And let's be honest, any pasta after the Uovo never stood a chance. We also got the Fresh Catch of the Day, which was a Walu (Butterfish). It was served with baby artichokes, Swiss chard and tomato ragu with a caper and mint salsa. It was perfectly cooked and a nice, light compliment to our pasta dishes. And because we just couldn't help ourselves, we ordered the Huckleberry Galette for dessert. We found out that a galette is similar to a tart, with more of a rustic, free formed crust. If you know me or the blog well, you know that I'm a sucker for anything huckleberry. (If you've never had one, they are similar to a blueberry, but smaller and way better. Sophia thought they tasted sort of like a blackberry). It came with a scoop of Swensen’s vanilla ice cream and drizzled with salted caramel sauce. In other words, a spoonful of YUM. You should definitely run for the Hills and get to this place ASAP! Speaking of...we need to get one on the books!